QUALITY BABY CARRIER - our uniquely designed hip seat baby carrier has everything needed for adult and baby comfort when out and about. Our lightweight baby carriers feature drool towels along with a mesh vent to keep baby cool. FANTASTIC GIFT - surprise a mom to be or a family with a new addition to our top quality, cozy baby carrier. With 5 different ways for baby to be carried, everyone can get through their day in total comfort whilst keeping baby safe and close. A fab baby shower gift! SIZE - whether you choose to use the kangaroo position or as a baby backpack, our premium quality, ergonomic carrier for toddlers is plus-size friendly for adult comfort and suitable for children aged 6 months old to toddler age (13 - 33lbs). GUARANTEE - take advantage of our no risk, 100% money back guarantee. If for any reason you are unhappy with your purchase please get in touch, so we can issue you with a complete, hassle-free refund. 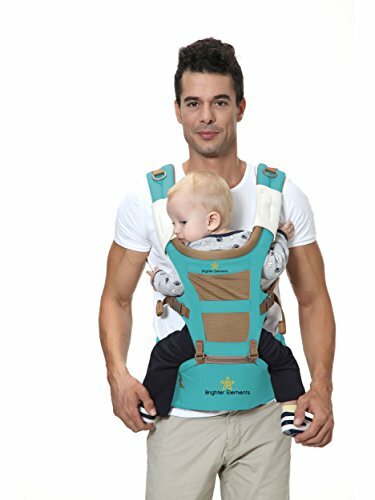 Baby Carrier 360° with Hip Seat by Brighter Elements – 8 Ergonomic Positions in 1 to Carry Your Baby or Toddler for All Seasons – Excellent Baby Shower Gift!